The Suquamish Clearwater Legends Cup is June 9-10 with a pro-am on June 8 on the Kitsap County course. 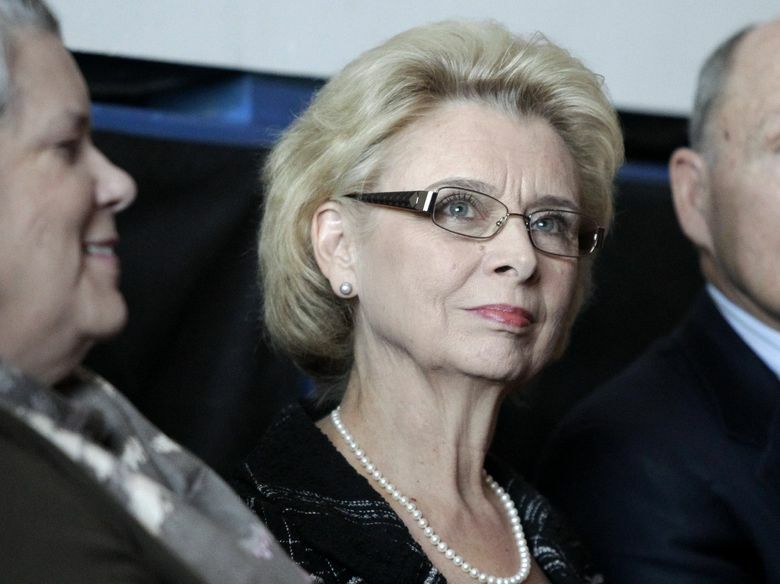 Former Governor Christine Gregoire was introduced Thursday as one of the key figures in bringing the Legends Tour stop to White Horse Golf Club in Kingston next month. Getting the 45 and older women’s golf tour to the Puget Sound area was a goal of Gregoire’s friend, Anne Fennessy, a partner in a Seattle public-affairs firm who is married to Seattle deputy Mayor David Moseley. “Anne Fennessy had a dream,” the two-term governor said. The result is the Suquamish Clearwater Legends Cup to be played at White Horse on the weekend of June 9-10, with the pro-am preceding the tournament June 8. Gregoire plans to play in the pro-am. Boeing is the presenting sponsor of the pro tournament, and Boeing employees will get in free. Gregoire, Blalock and other officials appeared at a news conference Thursday at the University of Washington Golf Center inside Hec Edmundson Pavilion. The 36-hole, stroke-play event will have a purse of $175,000 and a 30-player field. Two noteworthy players with ties to Washington are entered — JoAnne Carner, 79, the Kirkland native acknowledged as the greatest woman golfer the state has produced, and Wendy Ward. Ward, a Texas native who was two-time Pac-10 champion at Arizona State, is a four-time LPGA winner. She lives with her husband on a cattle ranch in Edwall outside Spokane. She turns 45 this week and will make her Legends debut in the tournament. The roll call of other golfers entered includes Patty Sheehan, Pat Bradley, Rosie Jones, Betsy King, Jan Stephenson, Hollis Stacy, Liselotte Neumann and Michele Redman. Organizers said free shuttle service to the course will be available for fans walking onto the Edmonds-Kingston ferry and the Seattle-Bainbridge ferry. Fans who drive to Kingston will be shuttled from the parking lot of the middle school and the Suquamish Clearwater Casino Resort. Adult tickets will be $15 a day or $20 for both days. Bruce Christy, White Horse general manager and head professional, said the par-72 course will play about 5,800 or 5,900 yards. He said he expects the winning score to be 6-8 strokes under par. Fans will be allowed to walk on most fairways behind the golfers. The Legends Tour has signed a two-year agreement and the tournament will return next year. The tournament’s designated charities are Kitsap Strong and the WomenSpirit Coalition.